Black Sabbath’s song, “Dear Father”, from their latest album, “13”, will be featured on tonight’s episode of the CBS television series CSI: Crime Scene Investigation. Airing on CBS at 10 PM ET, the episode entitled “Passed Pawns” sees the CSI team investigate the death of a homeless man who had a huge winning streak at a small casino. 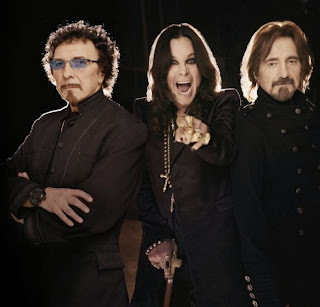 The broadcast marks the second time Black Sabbath material will appear on the program: the band premiered the album’s lead single, “End Of The Beginning”, on the season 13 finale of the series in May, prior to the release of the reunion record … and frontman Ozzy Osbourne had a small speaking role in the episode. Black Sabbath just completed a month-long tour of Latin America with Megadeth, and will launch a European trek November 20 in Helsinki, Finland. The band was recorded over two shows – April 29 and May 1 – in Melbourne, Australia during the early stages of the group’s current world tour.